Promote healthy eating by educating and engaging the public with the goal to optimize physical and emotional health for children, adolescents and their families. Educate children and their families and mobilize communities through information about public health programs, academic research and evaluation. Engage policy makers, educators to work collaboratively and actively support systems, environments, and policies that promote healthy eating. Generate innovative tools for public awareness of the benefits healthy eating practices. Support the development of measures of success. Throughout so much of American history, resources and choices were endless. We as a people are inventive and innovative in so many arenas. So why is it that we can’t feed our children well? Nothing could be more fundamental to this sense of failed expectations and dashed hopes than the way our children eat in their schools. Why can’t children in our public schools get the most wholesome, delicious food available? Why should schoolchildren refer to their food as “prison food”? Why do we continue to insist that it is impossible to change “the system”? This is a nationwide issue, and across the country, parents, teachers, principals, food services staff, cafeteria managers, janitors, politicians, doctors, nutritionists are all trying to solve this problem: our kids must eat better to live healthier, more productive lives. 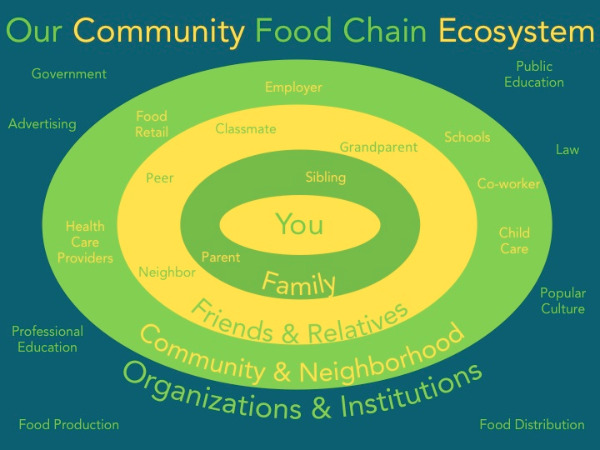 One of Our Food Chain 's goal is to educate and inspire parents, children, communities, and policy makers utilizing media to get involved in their school lunch programs, improve the food options in their home and in their communities. We are excited to announce that the documentary Our Food Chain is now available for all communities, parents, teachers, principals, cafeteria manager and school districts employees as well as policy advocates to share the good news about the positive changes in school food in the Los Angeles Unified School District and what you can do to make a difference in your communities. All non profit events are free to screen the short 6 minutes "sizzle" or the full length hour feature. Each day, in Los Angeles Unified School District (LAUSD), over 650,000 children from every imaginable ethnic and economic background are served school lunches and over 100,000 are served breakfast. In 2012, LAUSD took the first steps of improving the nutritional content of the school meals and a real “food revolution” began. We documented this revolution in collaboration with the LAUSD Food Services by creating a one hour documentary that educates and inspires parents, children, communities and policy makers to get involved in their school lunch programs, improve the food options in their home and in their communities. In this documentary, students, families, farmers, school staffs, and advocates’ stories are woven into a compelling narrative that highlights the successes and challenges of feeding children every day: Farmer to supplier to cafeteria manager to kids. This is "Our Food Chain." Every single one of our viewers has eaten in, or had a child eat in a school cafeteria in their lifetime. All will be able to identify with the challenges at hand. This film wants to encourage viewers to reflect on the current assets of the school food system and to learn how they can support the system to better serve the children. The timing is critical given the bold advancements in the lunch and breakfast menu options that LAUSD Food Services has implemented over the past few years. We propose this documentary to engage parents, children, communities and policy makers in an entertaining way that will activate them to support healthy food for all children and families.